Mamas & Papas is Great Britain’s number one baby brand. New to the U.S. Mamas & Papas is offering selected products through Babies R Us. Some of the items that you’ll see are strollers, baby carriers, bouncers, high chairs and toys. Mamas & Papas pride themselves in the quality and design of their products to bring you the very BEST! In the words of Mamas & Papas: We offer stylish, award-winning strollers for every journey, budget and lifestyle- so strap your baby in, put your best foot forward and feel free to take on the world. A range of lightweight strollers designed to suit every lifestyle and every budget. Mamas & Papas currently has five lightweight stroller styles to choose from. One thing that I absolutely love is that many of these strollers are accommodating to your child from birth on up to about 50lbs. These strollers are light in weight and they have shoulder straps making it easy to tote while on the go. They are practical, fold easily with their umbrella design and fit into compact areas whether you are using trunk space or you’re taking public transportation. Each stroller is unique offering a different feature separating it from the next but, you will find a few things in common with each design; they are ALL lightweight, and have canopies to provide shade, soft padded seats, compact umbrella fold, easy to maneuver with lockable front swivel wheels; soft handles, and locks into place when folded. Accessories are offered and sold separately for the strollers like the Umbrella Stroller Liner and Toddler handle & Cup holder. For more information and to see all the different styles offered you can head over to the Mamas & Papas Website. Stay connected and Follow Mamas & Papas on Twitter , and don’t forget to Fan them on Facebook too! Disclosure: I am participating for a chance to win one of five Mamas & Papas strollers. All opinions expressed in this post are my own. This stroller makes me wish that I was not maxed out on strollers for my little ones. Too cute! Visiting from SITS. I must say that I am happy that I don’t deal with strollers any more…woohoo. My stroller days are behind me. I do miss them sometime….for little bit. Stopping by from SITs to wish you a Happy Holidays! I have viewed all your strollers collection. All the strollers are now on trending in markets. Peoples always want to get updated with the flow. So your stroller collection are very useful for trendy mothers. 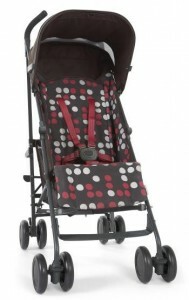 the first thing that will pop out at your is the stunning look of this stroller, it is simple and modern. I agree that it is perfectly suited as a “man’s stroller” as well. I love this one, however, and it will probably be my new go-to stroller.